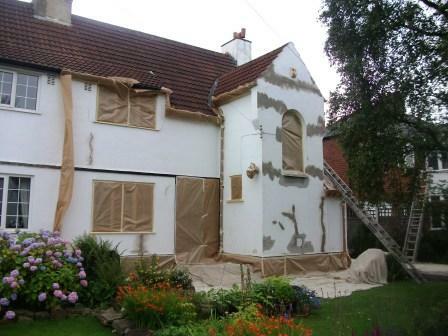 Is your home covered with render? Are there cracks in the walls, or maybe damp? Does the paintwork look shabby too? Then we may be able to help you. 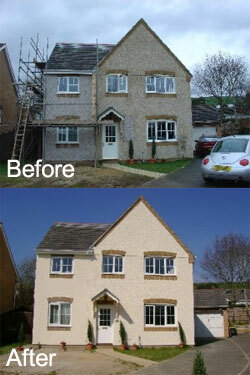 Our exterior wall coating system was used on this house, so take a look and decide if it benefits your home too! Rendered house walls are susceptible to paint flaking, cracks, and the growth of mould and algae making the walls green. 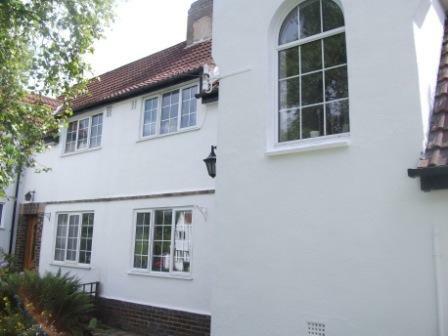 Render is also prone to cracking and needs a good weather protection finish in order to last and to keep looking good, such external wall coatings. And to be fair, most “normal” people just want that very fact. Their house to look good. It would be terrible to be known as “the scruffy family at number 16” wouldn’t it? I know some people just don’t care about their house which is a crying shame, but our customers are people who generally like to keep their house looking nice, but do not want the hassle and extra cost of paying a dodgy decorator to splash a lick of paint on the walls every single year. 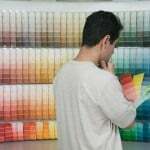 That yearly painting costs can really mount up and in the recession, with bills and costs going up all the time, that’s the LAST thing that you need. Typical problems associated with rendered houses. First and foremost, if you don’t know what exterior wall covering your house has, go outside and take a better look! Chances are that if it is smooth, or least not roughly textured, and no bricks are showing etc then its probably rendered. Damp penetration causing mould spots inside. 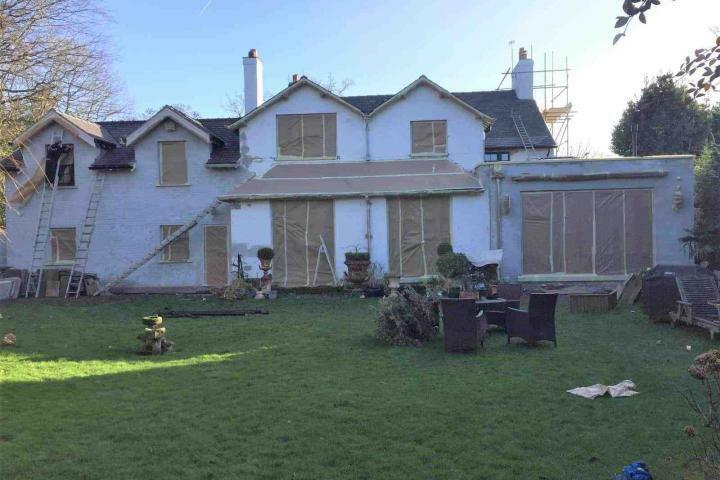 Previous alterations or repairs that can still be seen. Green mould growing on the outside. 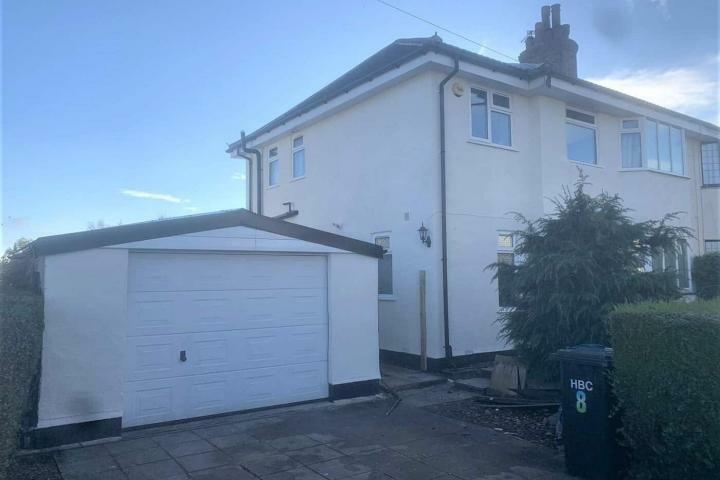 All these problems can hit your wallet hard if not attended to, and your local decorator will only paint over the top of these things, so you would have to get a builder in as well, just to make the house “sound”, let alone improve it’s appearance from the road! NPA External wall coatings can cure all this AND save you money! Instead of getting the same decorator, with the same poor quality, but probably with an inflated price than last year, choose never paint again UK to repair your walls and apply one of our special spray-on wall coverings to the exterior which come with a full repair service too. 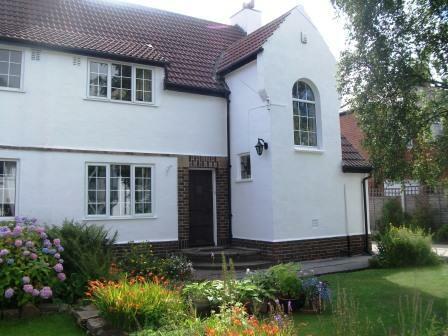 This property we did in Leeds, had quite a bit of poor render, flaky paint and a host of other issues. As you can see from the image, the grey strips and areas on the walls clearly show where the repairs were done. Once our wall coating goes onto the house, those areas will not be seen, even in direct sunlight against the house. 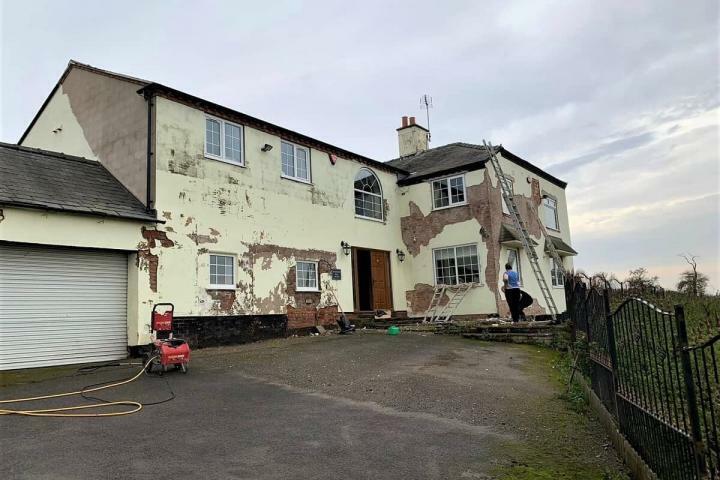 After the rendering patches and cracks are fixed, we apply by hand a special waterproof primer, and then allow to dry, before spray applying our protective wall coating to the house. The finished article can be seen in the next image. …and what a dramatic difference that is! Of course we don’t just specialise in rendering and houses with rendered walls, we also do pebbledash houses, tyrolean houses (sometimes mistakenly called terelene, which is a material) and brick homes too. Nothing is too difficult for our expert teams, who work very quickly and efficiently, and do NOT leave your house in a mess. Having us around to do the work is hassle free and the cost is far less than you think, for up to 20 years paint protection and no more repairs either! If you despair of finding a good builder AND a painter each year then put down that yellow pages at once! 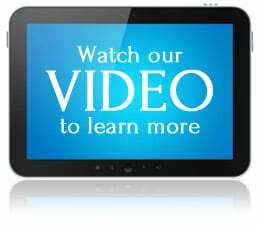 … and pick up the phone and book a FREE exterior wall survey from NPA. 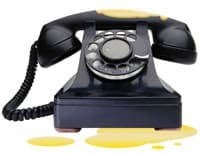 We can be contacted now on 0800 970 4928 or you can send us an email here. Don’t give your decorator any more money! How to tell a good decorator from a bad one?